participant Healing Harvest Forest Foundation, Copper Hill, VA USA, a restorative forestry non-profti foundation. be sent to the address to the left. All our mentors have been through Healing Harvest Forest Foundation training in chainsaw skills, horsemanship, and the business of logging and practicing restorative forestry. We are developing a Biological Woodsmen Apprenticeship program available for college students with the possibility of gaining credits towards an academic degree. Visit our web site to learn more about this program and our organization. Thank the people at Rural Heritage for helping you find this opportunity — subscribe or renew. Source of power: many draft horses of all breeds, mule and ox teams working also. 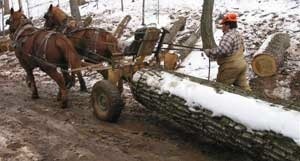 Draft Animals are used for: worst-first single tree selective logging. Acreage: thousands under management over 7 mid Atlantic states. Skills offered in: how to become a practicing biological woodsman. Work hours: variable-weather defined all seasons. Accommodations: usually private in community, sometimes with family. Apprentice must: be dedicated to making a living trying to save the planet by restoring the forests and enjoy feeling good about what you do with your life while liking being tired, plus have some common sense and reasonable expectations about living on a modest income. Application: available on our website. This file last modified: January 11 2017.